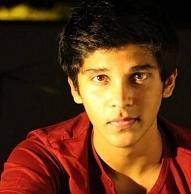 Want to hear Vikram's son Dhruv's plans? Chiyaan Vikram is a respectable name in the industry and the hard-working, talented, passionate actor’s next film Ai under Shankar’s direction is all set to hit the screens soon for Diwali. Meanwhile sources say that Vikram’s son Dhruv Krishna has shown keen interest in the field that his dad has chosen as a career, and all preparations are going on in full swing to realize this dream of Dhruv. Vikram being an understanding dad is encouraging his teenage son and is supporting him to take his interest forward. But the young lad is expected to take his time and it also has to be seen if he would opt for a career in front of the camera or behind it? For now it is education that junior Vikram is focusing on. Here is wishing the handsome Dhruv all the best! We are eagerly waiting. People looking for online information on Ai, Dhruv Krishna, Dhruv Vikram film debut, Vikram, Vikrams son Dhruv will find this news story useful.